The latest Husqvarna Automower Model 260ACX is a technology lovers dream mover. Not only will it mow your entire lawn automatically, but if it runs in to a bit of trouble along the way, it will let you know about it via SMS. It seems as though the text message is the king of communication these days; everyone is using it for everything, so why should your lawn mower be left out? The Automower is very similar in function to the automatic vacuums that are becoming more and more popular. The Automower does its job all on its own, but it uses a low voltage wire to keep it contained to your yard instead of the walls your vac would use. 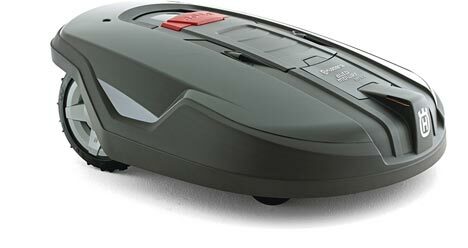 The 260 ACX uses a NiMH battery that allows a typical mow time of 1 hour on a single charge, and the charge time is about 40 minutes. When it is time for a recharge, your Automower will head on over to its charging station so it can get ready for another run. The 260 ACX is Husqvarna's commercial Automower model and has a cutting capacity of 1.4 acres. I know you must be thinking that your mower is theft waiting to happen, especially if it is all the way on the other side of the yard. But you don't have to worry, because it also features a built in alarm that must be deactivated before the mower can be lifted. Along with the GSM technology that allows for text messaging, the commercial unit also features a built in GPS tracker that should help you locate your mower if it should happen to get lost.